The book Douala in Translation was recently published. Its subtitle promises a ‘view’ of the biggest city in Cameroon and its ‘creative transforming potentials’. The fragmented city referred to above by AbdouMaliq Simone, is also reflected upon in a fragmented way. The reader will search in vain for coherence. An understandable city map depicting the places of concentration and intervention is not to be found. Such a map cannot possible be produced owing to its very inexistence, which is common for the African metropolis. The reader thus has to explore Douala through episodes, dreams, imagery, scraps of history, and academic analyses. Where it is located and what it depicts, like the enticing photographs of Edgar Cleijne, needs to be explained in the text. According to doualart, the fragmentation of the city carries with it the threat of violence. Self-organising neighbourhoods may turn into tribal fiefdoms that carry the seeds of animosity towards adjoining neighbourhoods. And doualart sees it as its task to intervene in the no-mans land between the fortress-like neighbourhoods, as Emiliano Gandolfi explains in his essay 'Art Differently: How art can make a change'. The Bessengue Bridge by artist Alioum Moussa, with railings consisting of multicoloured people holding hands, is a literal translation of this intention. 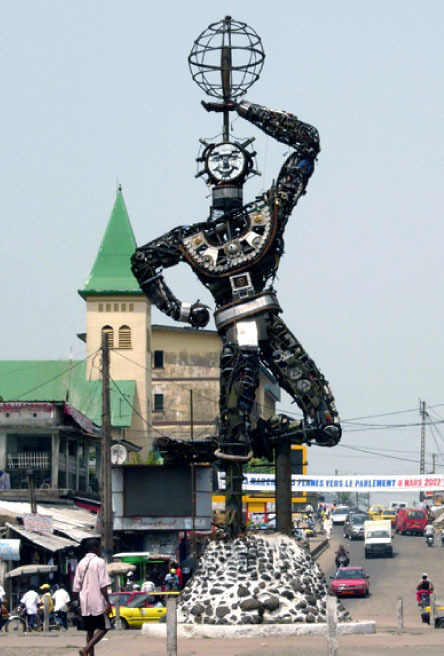 The impressive statue La Nouvelle Liberté at the Deido roundabout, which Joseph Sumégné made using scrap material, generated a long and hefty debate. In the end it creates a Nju Nju, or fetishized shared identity in Douala. This is an example of the galvanisation of civic society by engaging citizens in the transformation of urban space, as Zayd Minty would like to achieve. A drop in the ocean perhaps, but what else can you achieve in just fifteen years with few resources in an environment not spoiled with subsidies, a wealthy art-loving bourgeoisie or professional and wealthy planning institutions?
) Do you think youre angels commissioned to hand out praline chocolates in the midst of an equatorial post-war destructive scenario? Without having had the honour of meeting Didier or Marilyn, I think that there is nothing wrong with handing out pralines; theyre a fine alternative to the staple African diet, but you cannot sustain yourself on them. And Iolanda Pensa will agree with me that, to judge from the few interventions, we can safely conclude that doualart is making good its promise. I would really like to have seen many more works than words in this book, but many words are needed to convince the planners and policy makers of doualarts approach. 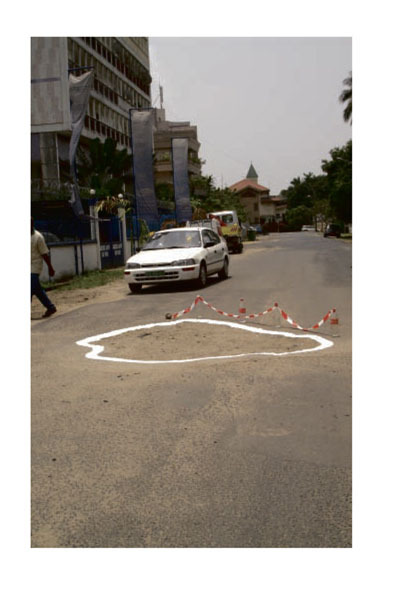 Alexander Vollebregts analysis of Douala detaches itself somewhat from the acupuncturist art interventions. Instead, he focuses on the individual who moves through the city. He argues that the city could be regarded as a living body, to which Didier Schaub comments that Doualas drive and energy could be compared to the mangrove forest adjoining the city. The mangrove forest being the most productive ecosystem on earth. The many errors of syntax and the printing mistakes leave one with the impression that the book was quickly thrown together. But these small irritations are more than compensated by the drive, importance and force of the material presented. I am anxiously looking forward to a follow up, a next evaluation, a synthesis of the promising multidisciplinary analyses made and, above all, to the next interventions of the people related to doualart. Marilyn Douala Bell is the great-granddaughter of King Rudolf Douala Manga Bell, who fought against the Germans and erected the famous Pagoda Palace in Douala. She set up doualart with Didier Schaub in 1991. Doualart is based on the assumption that artistic creation is a paradigm of development. Goddy Leye, founder of the Art Bakery in Doualas Barbizon-like artists suburb Bonendale, states it more explicitly: development is an aesthetic project.
) is best understood, not in a time overarching view, but in hundreds of stories that proliferate across the city  stories that produce shifting social spaces through which to navigate new possibilities in an urban environment where so many things do not work. The book Douala in Translation reflects on the Ars & Urbis International Workshop that was held in Douala in March 2007 and presents, for the first time in concise form, the work of doualart. 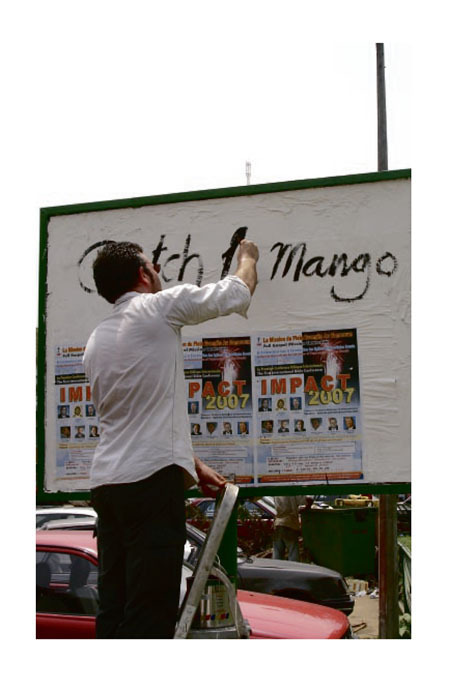 It is also intended as a reader for the Salon Urbain de Douala (SUD), which was held in December 2007. The workshop took place under a grove of mango trees laden with ripening fruits that threatened the heads and flashy laptops of the experts who were flown in to participate. Catch le mango. Experts from remote places and backgrounds turned this workshop into a truly cosmopolitan and multidisciplinary event. Artists, social and technical scientists, urban planners, architects and economists cooperated intensively and were responsible for a large chunk of the write-up.